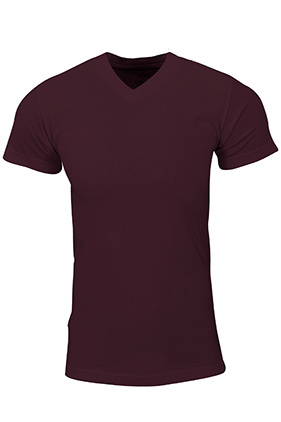 This heavyweight v-neck is one of the top four selling items. 100% USA cotton, 6.2 ounces, 16 singles v-neck. Shoulder to shoulder neck tape. 1" double-needle stitched and bottom hems. 7/8" seamless non-topstitched v-neck collar. Quarter-turned to eliminate center crease. Forward-thrusted shoulder seam for comfortable neck fit. Heat transfer label.